Fujitsu Laboratories Ltd. has succeeded in the real-time detection of early signs of storm sewer system overflows during torrential downpours, thereby obtaining data for effective analyses. The data was collected in a sensing system field trial initiated in July 2015 with the City of Koriyama in Japan's Fukushima Prefecture. The field trial also tested the effectiveness of energy harvesting technology that converts small amounts of energy from the natural environment into electricity. In this case, a highly efficient thermoelectric module was developed that is able to convert temperature differences into energy. These modules were attached to the bottoms of the manhole covers, and it was confirmed that they could generate levels of electricity sufficient for the stable operation of sensors over long periods. As a result, because there is no need to undertake the work of replacing batteries for five years or more, the trial demonstrated stability in sensing system operations. Based primarily on the results obtained through this field trial, Fujitsu Laboratories will continue development with the aim of commercializing this technology in fiscal 2016. In recent years, there have been numerous instances of torrential downpours that far exceeded the magnitudes anticipated in the operation of storm sewer systems. The damage from overflows stemming from such intense, localized downpours is becoming increasingly extensive. With limited human and financial resources, however, there is a need to utilize ICT, in addition to measures to improve storm sewer system infrastructure. To mitigate the damage inflicted on cities from these heavy rainfalls and torrential downpours, Fujitsu Laboratories is developing technology that can detect early signs of wastewater-system overflows(1) . This technology uses water-level detecting sensors attached to manholes to measure water levels for accurately detecting early signs of overflow. The City of Koriyama and Fujitsu Laboratories entered into an agreement to collaborate on a field trial of a sensing system to detect early signs of storm sewer system overflows, and from July 23, 2015, they commenced a field trial of water-level monitoring in real time using manhole sensing(2) . The trial demonstrated that, through wireless transmission of storm sewer system water-level data from inside the manholes, it is possible to monitor water levels in real time using a cloud-based system. 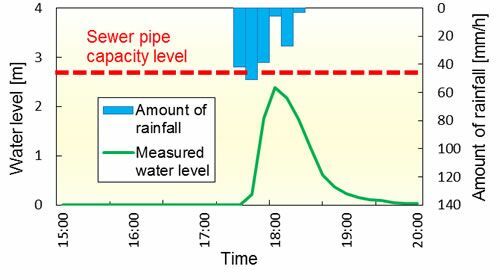 It detected early signs of sewer system overflows in the form of a sudden rise in water levels of 2.2 meters in 20 minutes at times of torrential downpours (figure 1). To verify the effectiveness of energy harvesting technology that converts small amounts of energy from the natural environment into electricity, Fujitsu developed a highly efficient thermoelectric generator module that uses thermal storage material. These modules were attached to the bottoms of the manhole covers, and the level of electricity they generated was verified (figure 2). The results were able to confirm that at least five times as much electricity was generated compared to conventional thermoelectric generators. In simulation trials, a sufficient amount of electricity was obtained to enable operation for five years or more, during which time it would not be necessary to replace batteries. By quantifying changes in water levels, it becomes possible to verify storm sewer drainage plans, and these can be put to use in formulating countermeasures to prevent flooding. Moreover, in addition to enabling expectations for significant reductions in running costs, the energy harvesting technology that obviates the need to replace batteries over a long period of time will also reduce the risks associated with maintenance work on manholes that are located in high-traffic areas. Based primarily on the results obtained through this field trial, Fujitsu Laboratories will continue development, for example, using analyses of actual measurement data to refine the accuracy of water level predictions, with the aim of commercializing this technology in fiscal 2016. In addition, in the City of Koriyama, sewer drainage plans for the Ochiaibori Storm Drain will be verified, and these results will be put to use in new countermeasures to prevent flood damage. A steel lattice used as a lid over manholes and gutters along roadways.